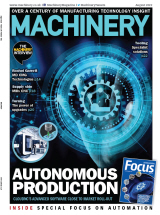 Machinery is a feature-led monthly magazine read by production engineers, production managers, production directors and managing directors in OEMS and sub-contractors engaged in metalcutting/metalforming. Machinery covers manufacturing technology developments and applications in key areas, including: machine tools; tooling; workholding; CADCAM; and inspection/quality. It also gives coverage to the developments and initiatives of manufacturing OEMs and sub-contractors, plus those of manufacturing technology suppliers.